Dyshidrotic eczema (pompholyx) is a type of eczema (dermatitis) of unknown cause that is characterized by a pruritic vesicular eruption on the fingers, palms, and soles. The condition affects teenagers and adults and may be acute, recurrent, or chronic. A more appropriate term for this vesicular eruption is pompholyx, which means bubble. The clinical course of dyshidrotic eczema can range from self-limited to chronic, severe, or debilitating. Pompholyx can sometimes be confused with similar-looking conditions. The condition’s unresponsiveness to treatment can be frustrating for the patient and physician. 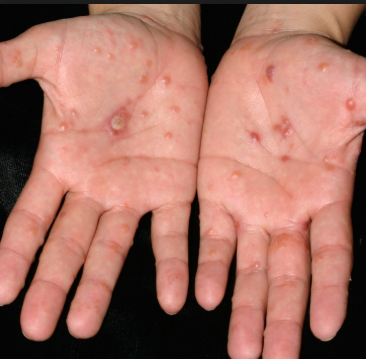 Some believe the terms pompholyx and dyshidrosis are obsolete and favor a new term, such as “acute and recurrent vesicular hand dermatitis.” The etiology of dyshidrotic eczema is unresolved and is believed to be multifactorial. Dyshidrotic eczema is considered to be a reaction pattern caused by various endogenous conditions and exogenous factors. In dyshidrotic eczema, notice blisters forming on fingers, toes, hands, or feet. The blisters may be more common on the edges of these areas and may weep fluid. Sometimes, large blisters will form, which can be particularly painful. The blisters will usually be very itchy and may cause skin to flake. Affected areas may become cracked or painful to the touch. The blisters may last up to three weeks before they begin to dry. As the blisters dry up, they’ll turn into skin cracks that may be painful. If scratching the affected areas skin may seems thicker or feels spongy. The blisters will usually heal within a few weeks. Atopy – As many as 50% of patients with dyshidrotic eczema have reportedly had personal or familial atopic diathesis (eczema, asthma, hay fever, allergic sinusitis). The serum immunoglobulin E (IgE) level frequently is increased, even in patients who do not report a personal or familial history of atopy. Genetic factor – Monozygotic twins have been affected simultaneously by dyshidrotic eczema. The pompholyx gene has been mapped to band 18q22.1-18q22.3 in the autosomal dominant form of familial pompholyx. In many cases, pompholyx will clear up on its own within a few weeks. The treatments may help relieve symptoms in the meantime. Try to avoid contact with anything that might irritate skin, including soaps, shampoos and other household chemicals. Use an emollient as a soap substitute and wear cotton-lined gloves when at risk of contact with other potentially irritating substances, such as when washing hair or doing housework. Don’t burst the blisters – let them heal on their own. If they’re particularly big, doctor may drain them. Steroid cream may use for a short period of time, to minimise risk of steroid side effects. Wear cotton gloves at night to help the cream sink into the skin. antihistamines to relieve the itching. Antibiotics may be prescribed if skin becomes infected. To confirm analyze, need to visit a doctor. Consultation with a psychologist may be helpful for stress reduction. Consultation with a dermatologist may be helpful for oral provocation tests for nickel, cobalt, or chromium salts. Before using antibiotic, must consult with a doctor.